If it's VOCs that are your primary concern, or if you suffer from asthma or pulmonary disease, the Healthmate HEPA Air Filters are your top choice for serious contaminant removal, especially gaseous, VOC contaminants found in paints and cleaning supplies. These low-maintenance filters feature an ultra long-life HEPA filter you change only twice a decade, a top-grade carbon filter and a natural mineral zeolite filter. The Standard unit features an ultra-quiet motor with three speeds, 360° intake and 24-hour-a-day operation. Uses 115W of power on high. Solid, welded-steel case and durable powder coating eliminate outgassing. Using this item in a smoking household or after painting or construction voids manufacturer's warranty. Casters on standard model only. 23½"H x 14½"L x 14½"W.
Four stage filter provides complete spectrum of air cleaning, helping remove sub-micron particles, noxious gases and chemicals. Stage 3: About 15 lbs. of Activated Carbon and Zeolite. Helps removes chemicals, gases and odors. Stage 4: 60 sq.ft.of Certified HEPA Removes 99.97 percent of all particles larger than 0.3 microns. If you have any questions about this product by Austin Air, contact us by completing and submitting the form below. If you are looking for a specif part number, please include it with your message. 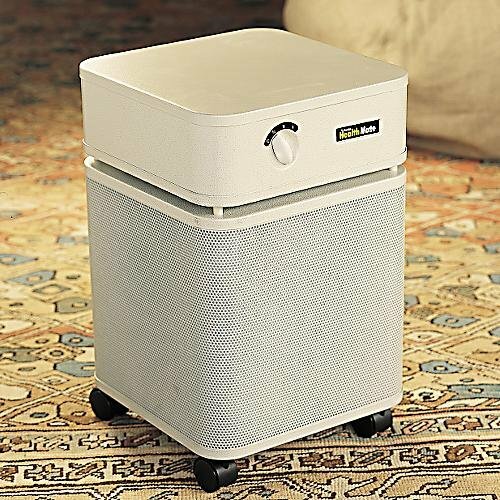 Austin Air Healthmate Air Purifier (HM400) Replacement Filter with Pre-Filter, White, Manufactured in USA!